Check out our 3-D virtual tour in "Virtual Tour Link 1! Beautiful country living at it's finest! This amazing home is situated on an acre of fenced-in green grass with mature landscaping including gorgeous Magnolia and Oak trees! The yard is secured by an electric swing gate with a solar panel to keep your property secure without having to get in and out of the vehicle to enter/exit. This home is perfect for animal lovers as it provides plenty of room for your dogs to run around but is also zoned for farm animals for those with horses or cattle! As you step into your beautiful home you are greeted by a large, open living room that seamlessly flows throughout the rest of the house. You will love spending your time here relaxing by your wood burning fireplace watching television or digging into a great book! This home is updated throughout with beautiful tile and laminate flooring, fresh paint, and upgraded appliances! As you step out onto your massive screened in lanai you will be in love as you look out onto your massive back yard with a 24ft above ground swimming pool with deck, a large utility shed with covered parking for your cars, as well as RV parking to keep your home on wheels out of the weather! 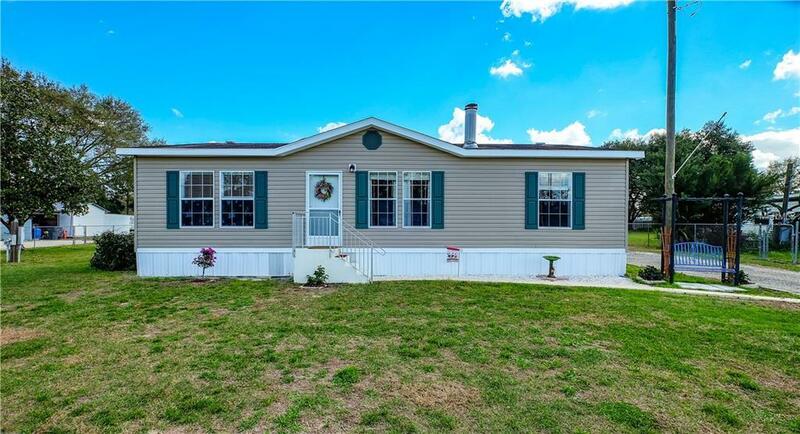 This home is low maintenance and move in ready with all of the recent updates, an automatic pool cleaner, and a well with a Kenmore water softener to help keep your pipes clear from mineral build up and your water clean and refreshing! Call us to schedule a showing today before it's too late!